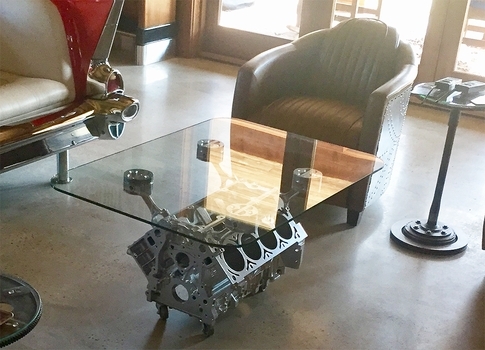 This Chevy Engine Block Coffee Table is for the true Chevy car guy. This table features a new GM 4.8/5.3L cast iron block with the pistons affixed to the block, leveled, and welded in place at the heads. The entire surface area is sandblasted clean and is powdercoated in a chrome looking finish. Finally, it is finished with a tempered piece of glass, providing you a perfect place to rest your drink! This table is made when ordered and has a lead time for 2-3 weeks plus transit.